There are people who are prone to have eye bags compared to others. But when we talk about wrinkles, all people will get them but not at a certain age. Some are prone to appear older than people their age and this is due to several things. You can count lifestyle, stress, lack of sleep, age, and the sun as causes of wrinkles. If you drink liquor regularly, eat fast food or instant foods, you would surely get premature wrinkles. If you have been smoking for quite some time, have not been sleeping enough, or indulge in a stress-related activities or work, then, you are not free from this issue as well. Additionally, people who love to stay under the sun without sun protection will find that aging comes early as it should. And don’t forget those who undergo a strict diet—people who want to lose fat the earliest time possible may have a problem with loss of facial muscles as well. This explains why some people look older and others in the same age group would look younger. Maybe the latter set are more careful then the former? If you think you fit well into this predicament, what would you do? Aging is a part of life and we can’t avoid it no matter how we try. What we can do is to avert the possibilities that may pose damage to our skin and this starts with looking at how we deal with certain factors. The sun makes us healthy and lets us enjoy our weekends and summer vacations. However, it also threatens us in a lot of ways, most especially our skin. Sunburn that leads to cancer and premature aging are among the many issues that make the sun a formidable foe that can act against us. One of the good things the modern world offers is a heap of solutions for common problems like wrinkles. The advent of sun protection products has found its way inside every home. But not all people in the world would remember using sunscreen. Some wear sunblock all day and use it regularly while others tend to forget due to their busy schedules. This type of remedy may not take away the possibility of wrinkle formation but can slow them down. The skin becomes increasingly dry and thin as we age and the most important thing to note is that the skin will eventually lose its elasticity. We have to accept the fact that the skin no longer produces the same amount of collagen like when we are young. Women start to lose huge amounts of the collagen requirement once they step on the age of 40 and up. This is the time when most of them would worry about getting old and wrinkles are the first symptoms that would appear. This is also where women must think of moisturizing their skin to smoothen out wrinkles. Moisturizers stimulate collagen and in the process, repair damaged skin. Exercise plays a big role in preventing wrinkles. A study showed that there were less active volunteers who participated in a research that required them to perform moderately strenuous exercises for a period of three months. The results were just fantastic. After having been biopsied, it showed that these participants, who were over 65 years of age developed tighter skin and both inner and outer layers of their skin looked like that of 20 – 40 year old individuals. This is evidence that proves exercising even in old age can still make changes to the skin’s appearance. What you consume every day affects your skin condition. If we take in a considerable amount of antioxidants, then, we are sure that we are helping the skin from the damages that free radicals bring. Free radicals can hurt the skin cells and lead the skin to age fast. The answer to this problem is to eat different varieties of colorful fruits, and also—vegetables. Lycopene and beta-carotene, as well as Vitamins C, A, and E are likely to slow down possible free radical damages. However, some people may want to take in these essential nutrients in pill or tablet forms, which is also a good alternative most especially for people who are too busy to prepare meals on a regular basis. But somehow, nothing beats natural ingredients. Since a lot of factors can toll on your skin, particularly the eye area, you need to be wary about what you are into each day. Below are some solutions people use. Wrinkles are not life threatening and only needs natural remedies to regulate if not to retard the aging process. If there are people who think that a medical intervention is best to resolve this issue, there are other people who are not fond of going through the knife. Surgeries only give you a few years before the next set of wrinkles appear. Fillers, Botox, lasers and peels can take out the weary appearance of the skin but what happens after they grow back on to the surface? Would you still be up for another appointment with a cosmetic surgeon? How many times will you have to pay just to cut back on years? And how can you be sure that your surgeon will not lead you to look you have suffered from a series of deformities? You can find eye creams everywhere. It carries the promise of becoming wrinkle-free using just a small amount of certain super moisturizer. However, these creams are very expensive that you can buy a very small bottle with a high price tag. Users have to be careful at choosing not just because they are bound to spend a fortune; they also have to know what is inside each tube or bottle to make sure what they are buying will not affect their skin. We neglect the idea that there are some ingredients found in the kitchen that are helpful when it comes to the wrinkle problem. Health and beauty issues can be resolved by these meal components and what’s best is they are not harmful for the skin. Coconut is a perfect example of a diverse food and its oil contains healing properties. Coconut oil is an antioxidant and contains Vitamins A and E and vital proteins that helps promote the production of collagen. Collagen acts as a skin firming agent and coconut oil helps in the form new skin cells. People who are into natural remedies found out that this oil prevents sagging as well as wrinkles. It’s all right to eat vegetables or drink them in liquid form. These foods are healthy and the body receives a lot of nutrients when consuming them. However, you can also use them for other purposes. You can even wear them! Cucumbers, avocadoes, and oranges are god remedies you can apply under your eyes. You can use avocadoes as a mask. This fruit contains retinol that boosts collagen production and new cell growth. 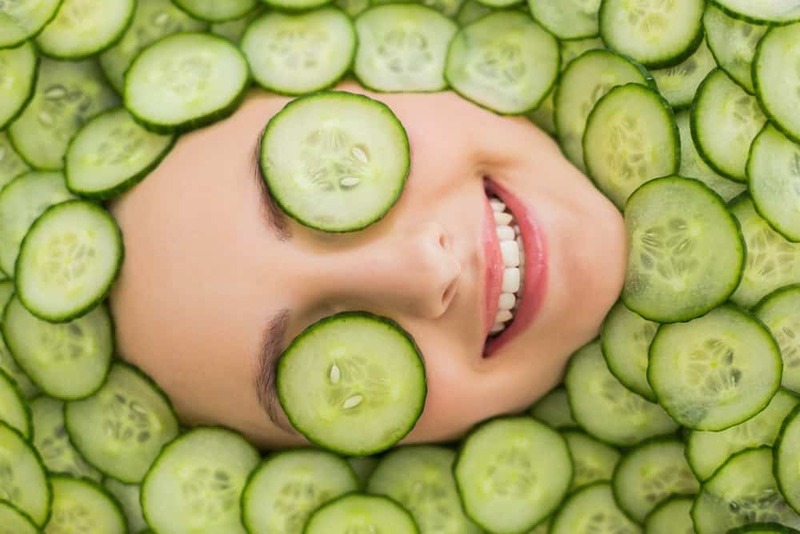 Place sliced cucumbers for 15 – 20 minutes under your eyes where the wrinkles always appear. Be sure to put honey first before topping it with a cucumber. Oranges, on the other hand, act as an astringent or dip a cotton swab on a fresh orange juice and apply it round the eye area. Just be careful you don’t let the juice get inside your eyes. Some of you may not believe it but facial exercises can do wonders to the facial skin. It works to make the muscles within the face active just like when you are trying to build muscle mass on some of your body parts. These exercises can tone and tighten the skin while it allows for more elasticity. There is also this thing called Facial Yoga that you can try. Just like other women who keep on trying on surgeries, these remedies are worth trying and the best part is it doesn’t endanger your appearance. There are different ways you can use to ward off wrinkles off your face but you have to understand that not all wrinkles will just go away after a few months. It takes every person to be careful with what they eat, know which tasks they do each day that makes them worry so much that generates these wrinkles, and looking at their lifestyle. Always remember that it takes one to start being careful at a younger age because once you reach middle age, you may not be able to get those wrinkles out from where they were already set. Also, take note that collagen is not a thing that you can just replace immediately. So, stop thinking that a rejuvenating cream can do better than anything else.